Comodo is an small, intimate restaurant in Soho specializing in a menu of Colombian-Spanish-Mexican-Brazilian-American influences that have been adapted to New York. However, what’e even more interesting than the fusion of these food cultures is the ‘social media fairytale’ of how the restaurant came to be. Ad-agency employee Felipe Donnelly and his wife Tamy Rofe began hosting private dinners every Thursday for local food fans that they connected with through Twitter. Their original idea of doing a dinner every Thursday for a year, and documenting the results on the Worth Kitchen blog, became sidetracked when the success and publicity of their project resulted in a knock on the door and a letter from the NYC Department of Health, informing them that they could no longer serve dinners to the general public from their kitchen. After the shock wore off, Felipe decided to leave advertising for good and the couple rented a commercial kitchen and began holding dinner parties for a crowd of 50-60 people. In December of 2011, based on the success of Worth Kitchen the couple decided to open Comodo (meaning ‘comfortable’ in Spanish). With the restaurant due to be opened in July, they leveraged crowdfunding site Kickstarter to help fund the last $15,000 worth of expenses. 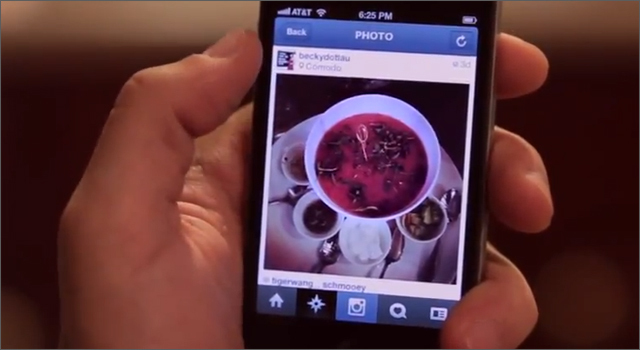 With the restaurant now open, Comodo is leveraging photos shared by diners on Instagram. Because right or wrong, food fans love to take pictures of their favorite meals; both as reminders of a great dish, but as a way to brag and make friends and followers drool. Comodo has printed the words #comodomenu on Instagram at the bottom of it’s table menu. Curious customers to what the dish looks like can simply grab their smartphone and search Instagram for the hashtag. Next item on Comodo’s menu should be a 100% mobile-friendly website. While the navigation is not in Flash, the ‘Story of Comodo’ video is embedded as a background element and prevents myself (and I suspect all mobiel users) from accessing the menu, reservations or anything else. 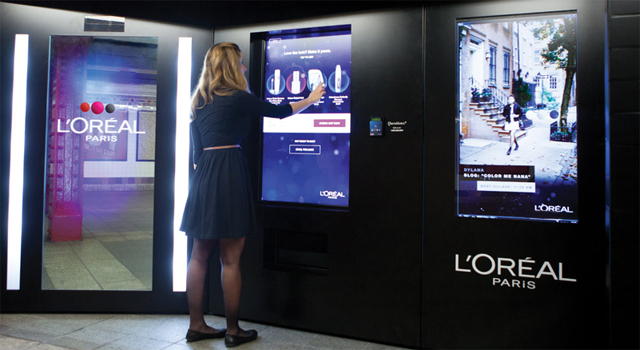 Last week, dog food brand, Beneful surprised NYC commuters with a virtual dog park inside the Columbus Circle subway station. The 64 foot long interactive wall features a group of playful dogs of several sizes and breeds. Motion-tracking cameras would watch as people walked by, triggering the dogs to start following them. The dogs then paw at the screen and bark to encourage the people to stand on one of the floor stickers, where gesture-tracking enabled them to play fetch with the virtual tennis balls on the interactive wall. After playing, commuters can choose to customize the dog of their choice and save a photo to their mobile phone to share on their social networks. Street teams promoted the interactive wall by handing out tennis balls and flying discs to commuters. Beneful will also be launching interactive walls in Chicago, Los Angeles, Atlanta and St. Louis this May. 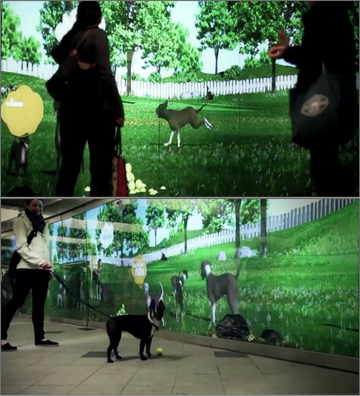 The Beneful virtual dog park was created by InWindow Outdoor. With the Ottawa Senators and New York Rangers set to battle it out on the ice at Madison Square Garden tonight, 6 influential Instragram photographers will be documenting the event, before, during and after the game. The photographers, hosted by Madison Square Garden and Delta will have special access to areas of the arena that not even national press have access to, and have been tasked to document the game in as a creative way as possible. 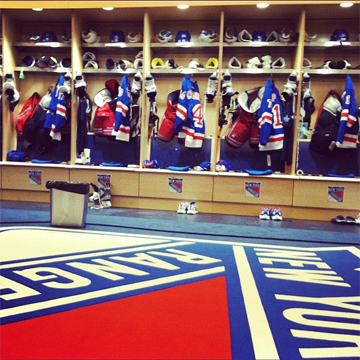 The photos will appear on Instagram and Twitter via the hashtag #NYRDelta, in the Rangers Facebook photo album and on the Rangers’ official fan site blueshirtsunited.com. Mauricio Parise, Delta’s U.S. manager of brand marketing communications explained on Mashable that the promotion is an example of how social media has changed traditional notions of sponsorship. “Just having the sponsorship is not enough — we need to make sure we bring it to life, and social channels are allowing us to do that in ways we haven’t been able to in the past,” he says. The Instagram app can be downloaded free on iTunes App Store of in Google Play. Calling All Brainiacs; Can You Solve Dow’s Giant Chalkboard Equation? Hey, no one told me there`d be math! 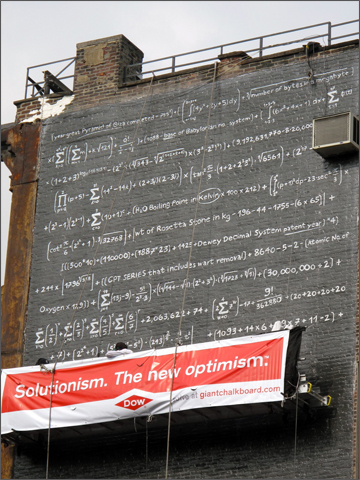 That was the first thought that went through my mind when I looked at the math problem being written on a giant building-size chalkboard in New York`s SoHo District. The problem is being revealed a few lines at a time over the week with the ultimate solution being revealed on Friday. The numbers in the formulas are associated with science and communications facts. From the obscure; 11232 (Patent number for bromine extraction) to the more mainstream; 8675309 (yes indeed, that`s Jenny`s phone number from the 1982 hit song by Tommy Tutone). It`s been hinted that when the answers to the formulas are put together it will create a narrative told in data. 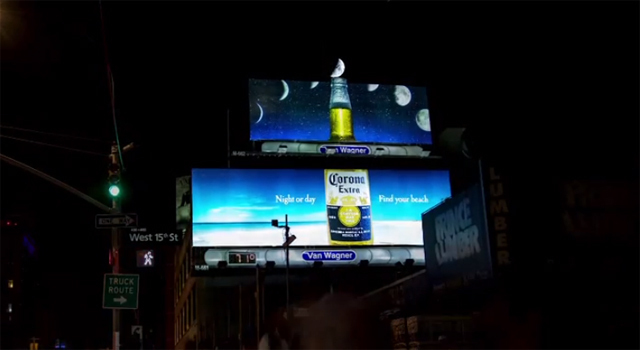 It`s all a teaser campaign dreamed up by the folks at Draftfcb Chicago for Solutionism, Dow`s discussion forum for technology, science and communication. You can follow the developing campaign on the Giant Chalkboard Tumblr blog or Twitter account. UPDATE Sept 26: On Friday the answer was revealed to be 7 billion, which represents the soon-to-be world population.